(Bloomberg Opinion) -- As the Federal Reserve issues its latest economic projections today, it finds itself stuck between a rock and a soft place. There is only one way to get out of it: very, very carefully. The rock, in this analogy, is a zero percent interest rate — below which, of course, rates cannot fall. They are currently only a few percentage points higher. Expectations for inflation, meanwhile, are softening. The trick for the Fed will be to manage inflation expectations without having to reduce rates too soon. Fed Chairman Jerome Powell has already gone to some lengths to make clear the Fed’s willingness to be patient about rates. In the short term, the Fed plans neither an increase nor a decrease, but to wait and see what the data has in store. This approach has done wonders to calm the markets and restore confidence. But it soon may create problems of its own. Inflation has run below the Fed’s target of 2 percent every month but one for the last five years. Now, however, consumers are expecting inflation to fall even lower. To understand why that’s not necessarily a good thing, some history is in order. For decades, the Fed has seen its primary mission as keeping inflation expectations low. Its failure to do so in the late 1960s is blamed for the stagflation that the economy experienced in the late ’70s. The thinking goes like this: When interest rates are low, consumers and businesses increase their purchases of big-ticket items like houses, cars, warehouses and machinery. The factories that make these products hire more workers. That lowers unemployment, which further increases consumer and business confidence, leading to more spending. At first, this virtuous cycle drives economic growth higher. But eventually workers and raw materials will become more expensive and costs will rise. These higher costs will eventually result in higher prices for consumers. In the 1960s, many economists assumed that the story stopped there. Higher prices, they figured, were bad — but higher unemployment was worse. Consequently, they encouraged the Fed to keep interest rates as low as possible for as long as possible. As the 1970s began, however, low interest rates were translating into increasingly lower growth and increasingly higher inflation. Over time, consumers had come to expect higher prices, so they bargained for regular wage increases. Businesses, in turn, expected higher costs each year. The cycle that once produced an abundance of growth had been short-circuited — and now the economy was experiencing not only high inflation but increasing unemployment, as cost-conscious businesses became reluctant to hire. There was only one way for the Fed to stop this spiral: It had to change consumers’ expectations. It had to convince them that prices would remain relatively steady, and they need not demand large preemptive wage increases. Fed Chairman Paul Volcker did manage to pull this off — but it required sky-high interest rates and bruising back-to-back recessions in 1980 and 1981-82. Fed officials who came of age in that time vowed never to let it happen again. And indeed, it hasn’t. In their zeal, however, they created a new problem. When inflation expectations fall, so does the so-called natural rate of interest — the rate at which the economy grows steadily, neither too fast nor too slow. Inflation expectations have fallen so much that the rate is now somewhere between 2 and 2.5 percent, about what actual rates are. What happens, then, if the economy faces a recession? The traditional answer is for the Fed to lower interest rates, to stimulate more spending. But the Fed doesn’t have much room. And falling expectations of inflation only make things worse, because they reduce the natural rate of interest. What’s the Fed to do? It could still cut interest rates, getting ahead of falling inflation expectations. But that would contradict the message of patience that the Fed has been preaching. A better alternative is for the Fed to emphasize its concerns about falling inflation expectations. This strategy is fraught with risk, as managing expectations always is. First, there is the semantic difficulty of communicating expectations about expectations. Then there is the usual danger of the markets parsing the Fed’s message too closely: If the Fed says it is afraid that inflation expectations might fall, does that mean it expects them to? And if the Fed expects them to, shouldn’t investors? And if investors do, won’t consumers? 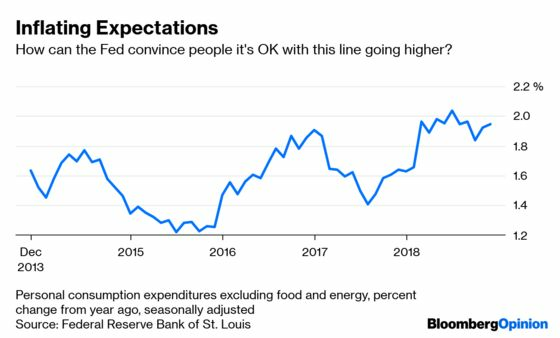 And, if consumers expect inflation to fall … well, the Fed will have achieved nothing. Far better for the Fed to issue a threat instead of a warning. If inflation expectations continue to fall, the Fed should say, then we are going to have to abandon our plans to be patient and start cutting interest rates aggressively — and the markets would be wise to recognize that now. That message, if clearly received, would cause inflation expectations to rise (or at least stop falling), and give the Fed more room for patience. It will not, however, be an easy message to send, especially after decades of a single-minded focus on keeping inflation low. If Powell can deliver, he might be able to keep the U.S. economy growing for a few more years yet. Karl W. Smith is a former assistant professor of economics at the University of North Carolina's school of government and founder of the blog Modeled Behavior.